All software applications available to download from Jianway website are free for non-commercial use. If you have used software featured on our website we'd love to hear from you. Desktop Timer helps you to monitor how much time you spend on various projects and tasks. We use it to improve efficiency and accuracy in project management. 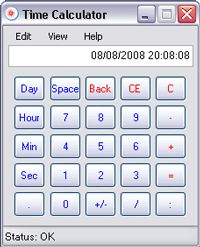 Time Calculator is used for calculating time in various date and time formats. When the file is downloaded, extract files and run TimeCalcSetup.msi to install the application. Text Replace is used to replace or remove exact text strings from a number of files simultaneously. Text Replace does not use regular expressions to replace or remove text. When the file is downloaded, extract files and run setup.exe to install the application. We develop web applications which can be used in place of the commonly available desktop applications. Online apps come in handy if you use a netbook or if you have limited access to locally installed software. Desktop Timer helps you to monitor how much time you spend on various projects and tasks. Essential for efficient project management.